As every Chinese festival has a significant amount of importance attached to it, the Mid-autumn or the Chinese Moon festival is also one which has risen out of storytelling and legend. Mainly celebrated in the Chinese and the Vietnamese communities, this festival embarks upon a journey that makes the person who experiences this, acquainted with the Chinese culture and principles. This festival is celebrated traditionally on the 15th day of the eighth month – a full moon day, but there is no fixed date at such. The name is such because of the season it falls in and is also known as the Moon Festival, as at that time of the year the moon is at its roundest and brightest. The main reason for the celebration of this festival is related to agriculture and the cultivation of crops. The reason also has roots related to sacrifices to the moon. The Chinese hold on to a strong belief, that the cycles of the moon affect the agricultural cycles as well to a certain extent. This belief makes them worship the moon and they make sacrifices to it so that their yield comes out fine. The sacrifices are also made at times, as an offering in gratitude towards the moon. Earlier, during the times of the Zhou Dynasty, the festival didn’t have much significance and it didn’t hold much importance. But with the coming of the Sui and the Tang dynasties, social prosperity inspired the custom of appreciating the moon on the moon sacrifice ceremony day among common people and the two merged, giving rise to this festival. The moon is always looked at with respect in the Chinese culture and a lot of myths and stories are associated with eclipses and the cycles of the moon. An important part of the festival celebration is hence, moon worship. The ancient Chinese believed in rejuvenation being associated with the moon and water, and connected this concept to the menstruation of women, calling it "monthly water". The waxing and waning of the moon made it symbolic to the pregnancy of a woman and the stars ending up as a result of the moon giving birth to them during each cycle. The people believed in this and hence, the women ended up taking an active part in the celebrations as well. The customs mainly involve people worshipping the moon, making sacrifices to it as a form of expressing gratitude and it also involves eating the moon cakes. 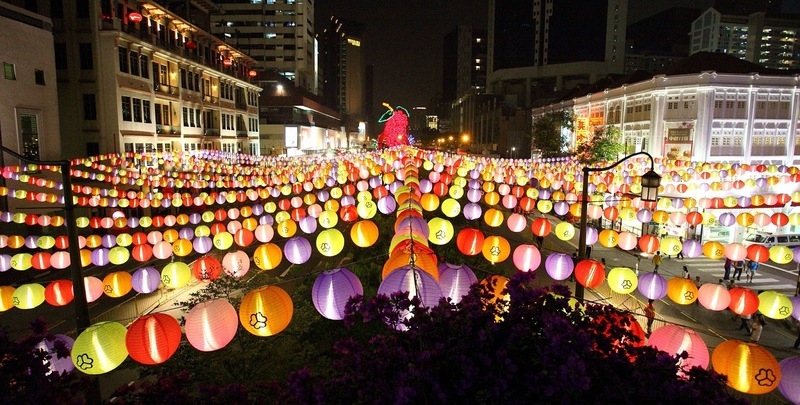 In addition, there are some other customs like playing lanterns, and dragon and lion dances in some regions. The unique customs of ethnic minorities are interesting as well, such as “chasing the moon” of Mongolians, and “steal vegetables or fruits” of the Dong community. Where is the Chinese Moon Festival celebrated? Mainly, East-Asian countries like China, Taiwan, Japan, Singapore, South Korea, Malaysia, Vietnam and the Philippines observe the celebrations diligently. But Chinese people all over the world come together for dinner and moon cakes in this day. As a part of the popular tradition, the Mid-Autumn Festival is an opportunity for families to get to spend time with one another, in spite of the fact that there are sure customs. A standout amongst the most widely recognized approaches to celebrate is by eating moon cakes (or Bánh Trung Thu in Vietnamese) – a thick, sweet baked cake that is prepared or steamed and normally enjoyed with tea. Most are loaded up with lotus paste and salted egg yolk while others contain red bean or date paste, just as a natural product, nuts and seeds. Individuals will share moon cakes with relatives and partners. Many communities also celebrate by lighting paper lanterns, while some neighbourhoods will take part in lion and dragon dances for luck. That just adds to the whole magnanimity of the event and gives a boost to its splendour. The lantern, is a very crucial part of the Chinese culture is used here too. It gives the whole festival an authentic touch and adds to the vibrancy of the whole occasion. Since the day is off for most of the employees, they choose to spend it with their families and friends and they come together to celebrate and exchange a good amount of moon cakes and eating some good home cooked meal. Public parks are lit with special displays and lanterns; there may be stages with cultural shows and parades. Dragon and lion dances are popular during the festival. Incense is burned in temples to honour ancestors and the moon goddess, Chang'e. Bright lanterns are hung high from poles while floating, candle-powered lanterns get launched into the sky. What’s all the hype anyway? Chinese moon cakes are round, baked, palm size cakes eaten and gifted during the Chinese Moon Festival — or anytime a rich delicacy is in order. They're a popular gift, often given in decorative boxes to clients, family members, and important people. And it is not just one traditional recipe that is being followed for ages now. Chefs have taken it upon themselves to make these moon cakes into a complete marketing phenomenon. They have challenged the boundaries of flavour that the moon cakes come in and they keep surprising the customers each year with one new flavour or the other. So, the Moon Festival is not all that bad. It is actually one of the festivals that is actually looked forward to, in China and Vietnam. And not just there, in all the Chinese communities around the world. The festival brings families together over moon cakes and gratitude. What more could you possibly ask for?